Not everyone has the same number of bones in his feet. Often both the hands and the feet contain extra small accessory bones, or ossicles, that sometimes cause problems. The diagnosis begins with a complete history and physical examination by your consultant. Usually the condition is suggested by the history and the tenderness over the area of the navicular. X-rays will usually be required to allow the consultant see the accessory navicular. Generally no other tests are required. If the foot becomes painful following a twisting type of injury and an X-ray reveals the presence of an accessory navicular bone, your consultant may recommend a period of immobilization in a cast or splint. 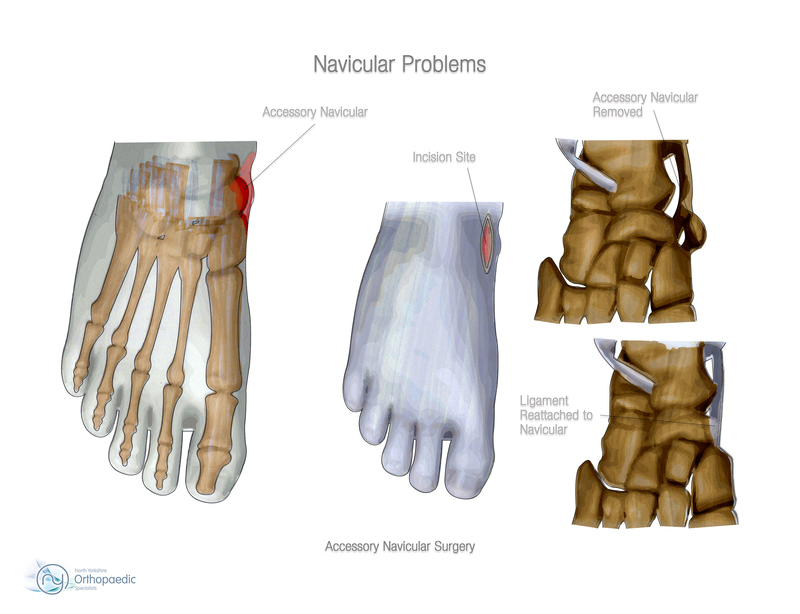 This will rest the foot and perhaps allow the disruption between the navicular and accessory navicular to heal. Your consultant may prescribe anti-inflammatory medication. Sometimes an arch support can relieve the stress on the fragment and decrease the symptoms. If the pain subsides and the fragment becomes asymptomatic, further treatment may not be necessary.